Grape Juice Records recently announced the signing of Jon Drake & The Shakes. The band recently released a free ep called Side A, and will no begin to record their debut album. The band has been together for two years, and have built a solid fan base. The signing will be celebrated on February 11 at part one of the Grape Juice Records 2011 Showcase Series at Subterranean in Chicago. The night will feature Jon Drake & The Shakes, Chaperone, Rachele Eve and Julie Meckler. Deli NYC Issue #25 is out! 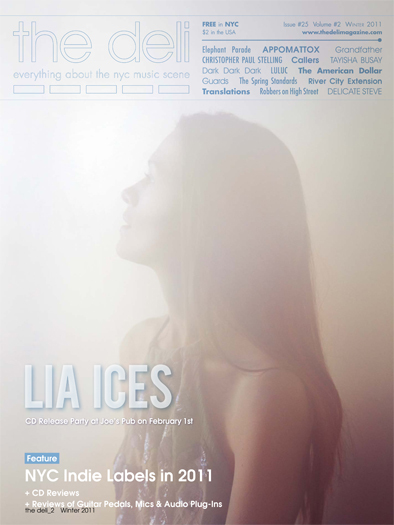 Lia Ices on the cover! Here at The Deli we take winter seriously. Our frostiest cover ever graces our 25th NYC issue (check it out in pdf version here), which was coincidentally delivered yesterday throughout a frosty Big Apple, covered in snow. Psych Folk songstress Lia Ices - who is celebrating her CD release party at Joe's Pub on February 1st - and the gorgeous foggy picture shot by Kate Edwards add two extra wintry elements to the package. In this issue you will also find features about NYC Indie Labels, Delicate Steve, Appmoattox, and - of course - a slew of Q&As and reviews. Enjoy! Helicopters have released a wonderful collection of 18 "bits, bites, demos and b-sides (2005-2010)" called Not Diamonds But Diamonds. The collection is available for free through bandcamp. Briar Rabbit (aka Phillip-Michael Scales) is new to Chicago, but he has already fallen in love our city. He brings with him a powerful voice and strong musical sense and background. He was born in Detroit and has always been fascinated by and practicing music. He was formally trained in Boston, and now has found his way back to the Midwest to call Chicago home. His debut album, Briar Rabbit & The Company You Keep, was recorded both in Boston and here at CarterCo Studios. The seven-song album can be purchased here where you can also here a few of the tracks. Briar Rabbit will be performing a free show at The Whistler on Sunday Jan. 30th at 9:45. Village has released their new album Local Moves, and you can download it for free through soundcloud. The band combines elements of surf pop, lo-fi, and even a touch of rockabilly (see "Eye Sore"). The album raw, but energtic and great winter's day listen. Village will be performing at Empty Bottle on Feb. 10th with Maximum Wage.